Michael Bullock died in hospital in London, England, on July 18, aged 90, survived by his daughter Miriam, son Marcus, granddaughters Susannah and Zoe, grandson Daniel, and great-granddaughter Gabrielle. Born on April 19, 1918 in London, England, Michael Bullock lost his mother when he was ten months old, an event to which he later ascribed much significance as a sexual questing male. He studied at Hornsey College of Art. From 1952-1968, he worked as a freelance writer and translator. In 1968, Michael Bullock came to Canada as a Commonwealth Fellow at UBC, encouraged to teach at the university by J. Michael Yates. "The name Vancouver meant almost nothing to me," he once recalled. "I looked it up in the Encyclopedia Britannica, where I read that 'Stanley Park is the largest urban park in the world.' I immediately cabled my acceptance of the invitation." In 1969 he was the McGuffey Visiting Professor of English at Ohio University. 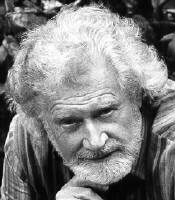 In 1970 he joined the Creative Writing Department at the University of British Columbia. At UBC he was also head of the translation program, retiring as professor emeritus in 1983. In 1994 he was New Asia Ming Yu Visiting Scholar at the Chinese University of Hong Kong. Greatly influenced by surrealism in his early years, Bullock wrote a surrealistic novella, Randolph Cranstone and the Glass Thimble (1977), that was a British New Fiction Society Book of the Month. He has translated many books and plays from French, German and Italian including André Carpentier's collection of Gothic tales, Bread of the Birds (Ekstasis, 1993). He is the subject of a critical book by UBC English professor and friend Jack Stewart, The Incandescent Word, published in 1990. In 1998, his Selected Poems 1938-1993 were published in China, chosen and translated by Dong Jiping. In 1999, The Walled Garden (Ekstasis) was published in China by Guang-Xi Nationalities Publishing. It was his fifth title to appear in Chinese. Ajmer Rode of Vancouver provided a Punjabi translation for One Hundred and One Surrealistic Poems, published in Amritsar in 1996. Bullock celebrated his 85th birthday in the United Kingdom with a three-week retrospective exhibition of his books and artworks, under the title Michael Bullock and his Universe, at the Volume Gallery in London. A new poetry collection Colours was launched as both a printed book and as a CD. He marked his 90th birthday in England with the release of Seasons: Poems of the Turning Year, a collection of short nature-inspired poems. Bullock published more than 50 books of literature, many of which were self-published. Selected Works 1936-1996, ed. Peter Loeffler and Jack Stewart (Third Eye, 1998). Sokotra: A Play. (Rainbird Press, 1997). Voices of the River: A Fantasia. (Rainbird Press, 1996). The Invulnerable Ovoid Aura: Poems and Stories. (Third Eye, 1995). The Incandescent Word: The Poetic Vision of Michael Bullock. (Third Eye, 1990). Winner of the Canada Council French Translation Award (now superseded by the Governor General's Award) for Stories for Late Night Drinkers by Michel Tremblay, 1979. British New Fiction Society Choice for Randolph Cranstone and the Glass Thimble, 1977. Winner of the Schlegel-Tieck German Translation Prize for Report on Brunoby Joseph Breitbach, 1966. [LITHIS / BCBW 2008] "Poetry" "Translation"
I first met Michael Bullock in 1976 when he brought a manuscript to Intermedia Press for us to publish. It was a translation of Michel Tremblay's Contes Pour Buveurs Attardes (Stories for Late Night Drinkers) that appeared in 1977 and won Michael the Canada Council Translation Prize. In 1978, Intermedia Press published Contemporary Surrealist Prose with selections from H.C. Artmann, Rikki Ducornet, and 18 prose poems by Michael. In 1991, I published his book Stone and Shadow under the Poem Factory imprint. Around that time, a group of surrealist writers and artists began to coalesce around Michael and Ladislav Guderna (1921 - 1999), both senior artists who had left the old world and immigrated to Vancouver. Michael had a direct connection with some of the original surrealists including Conroy Maddox and Eileen Agar and Ladislav knew Man Ray, Oscar Dominique and Roland Penrose. Michael and Ladislav joined a group of younger artists, called the West Coast Surrealists, including Robert Davidson, Gregg Simpson, myself, and Leo Labelle and Ted Kingan, (1927 -? ), another senior artist from Michael and Ladislav"s generation. Ladislav's son, Martin Guderna, as well as Andre Somov, David Cochrane, Dorothy Manning and writer Rose-Marie Tremblay were also members. We had several exhibits together at the Gallery Move in North Vancouver and then in Vancouver. The group added members of a third generation, writers Hosea Hirata and Tim Illess, both students of Michael's creative writing courses at UBC. In 1982, the group morphed into the Melmoth Group, named by Michael after the book, The Wanderings of Melmoth, a classic surrealist text. The older members of the group were adamantly "surrealist" while the younger artists were less willing to be defined by the "surrealist" label. There was, however, egalitarianism between generations and a profound respect between all the members that was impressive since there was nearly fifty years difference in age. And they were linked by general adherence to the basic tenets of surrealism, fantastic images drawn from dreams and the psyche, and careful craftsmanship in giving these phantasms form and life. We did quite a number of exhibitions together including The Simon Fraser University Gallery, the Pitt International Gallery, the Threshold Gallery, Artropolis 90, the Alpha Gallery, and the Simon Patrich Gallery. In 1984, Lori-ann Latremouille, Davide Pan and Sheri-d Wilson joined the group and Martin Honish and a year or so later Martin Honish and Jan Wade. Some members moved away, some drifted away and Dorothy died in 1980. Michael was one of the pillars of the group, along with Ladislav, and provided a sense of mission and continuity with the past as well as points of contact with other contemporary surrealist artists in Europe. Michael had attended art school in London and always contributed drawings and painting to the exhibitions but he was essentially a writer both of prose and poetry as well as a gifted and prolific translator. His writing is both fantastic and meditative at the same time, full of images and metaphors drawn from nature and written from a contemplative point of view. He published an astonishing number of books in his lifetime and many of them were translated into other languages - particularly Chinese. Over time, he developed an enthusiastic and vast audience in China because his poetic sensibility paralleled both the style and the themes of Chinese poetry. He remained creative and vital until his death. I first met Michael Bullock in 1984 at a surrealist art exhibition put on by the Melmoth Group at the E=MC Squared Gallery in downtown Vancouver. His paintings were on exhibition and he gave a fabulous reading of his wild surrealist poetry and prose. I was deeply impressed with the imaginative and energetic style of his works. I introduced myself and spoke with Michael about his work and told him I was an artist. At 21, I was just beginning to show my artwork and happened to have a couple of my charcoal drawings on display at the artist run gallery next to the E=MC Squared Gallery. Michael Bullock introduced me to another founding member of the Melmoth Group, artist Ladislav Guderna. After seeing my artwork both Michael and Ladislav invited me to show my drawings with the group. As a young artist this was a tremendously encouraging event. It gave me a sense of place and acceptance in the Vancouver art community. Michael and I both lived in the Dunbar area on west side of Vancouver. We often met to organize shows and other activities for the Melmoth Group. Living in the same nieghbourhood Michael and I also became close friends. We spent many happy hours walking my dogs in the beautiful forest at Pacific Spirit Park. Michael wrote an entire book about the park titled "Poems On Green Paper". After the death of Ladislav Guderna in 1999 the Melmoth Group drifted apart. Michael Bullock, myself, and my partner Angus Bungay continued to work on art projects. Angus Bungay filmed and edited three short art films based on Michael's poetry. I provided cover images for several of Michael's books and Angus designed the book covers. Nothing was ever boring with Michael around. Anything ordinary could easily be transformed into the extraordinary. He was an artistic wizard and all of nature danced at his feet. The landscape was alive. The trees walked, streams whispered poetry, and stones were slowly roving creatures. I feel so priviledged to have spent so much time with Michael Bullock. Being there when he would suddenly write a poem inspired by walking in a garden. Watching him paint. Listening to stories of his truly fantastic life adventures. There were two stories that really stood out from when he lived in India as a young man. One day he rode a white horse through a vast Rhododendron forest teeming with colourful butterflies. Another, his meeting a young Indian woman named Maya who was a painter and poet. When her parents found out that she was spending time with Michael they immediately had her married and sent away. She left him a love letter, photograph of herself, and a painting she had done for him. He kept the photograph of her on his mantle his entire life. I was so impressed by both stories that I did a very large charcoal and pastel drawing inspired them titled " Memory of a Paradise Lost". Michael often visited and talked with great enthusiasm about his loving and very artistic family in London, UK. Miriam, his daughter, made beautiful etchings. Susannah, his granddaughter, was a fabric designer and painter. When visiting in London he often enjoyed assisting Susannah with hand printing her designs on silk. Daniel, his grandson, was a photographer, and provided excellent photographs for some of his books. His son-in-law, John, was immersed in the film scene in London. He also spoke a lot about visits with his son Marcus and his granddaughter Zoe who live in Milwalkee, USA. Marcus was also and writer and professor and Zoe who was an extremely bright and excelling student at university. He was so very proud and took great pleasure in his whole family. Michael was always so supportive of my artwork. He purchased and then later donated several of my drawings to UBC. He also encouraged me to do song writing and funded my first recording. As both an artist and friend, Michael was relentlessly inspiring and encouraging. He is my mentor. His creativity, kindness, love of nature, sharp wit, and friendship will walk with me always. to the wandering observer of his work. I've just heard from Vancouver poet George McWhirter that the Anglo-Canadian poet, fiction writer artist & translator Michael Bullock has died in London, England. He was perhaps the last link with pre-war British surrealism as exemplified by Herbert Read, David Gascoyne and Conroy Maddox, being initiated in the group after a visit to the London Surrealist Exhibition in 1936. Subsequently he made a living as a freelance translator, winning the Schlegel Tieck prize in 1965 for his translation of Ingeborg Bachman's poems. I took Michael's translation workshop as part of the UBC CW program in 68-69, and I remember the patient and resigned way he drew my attention to the dozens of ludicrous mistakes I'd made in my attempt to translate Andre Breton's Poisson Soluble. He may have been a surrealist, but he was a very classical, meticulous surrealist. This was reflected in his prose poems, where formal syntax and a grave persona delivered rich dream narratives. He was, I suppose, the Paul Nash of British surrealist writing, less turbulent than early Gascoyne, closer in sensibility to Magritte rather than Dali. He was also generous in listening to the confidences and confusions of young writers. He was a generous and supportive tutor in graduate school at UBC, managing to hang on to his very British sang-froid amid all the furore generated around him by Mike Yates, Andy Schroeder and other great mavericks of that era. George McWhirter was right there alongside me and doubtless has more anecdotes. Yates, a German speaker, had a lot of respect for Michael's skills and Michael played a key role in founding Contemporary Literature in Translation. Michael Bullock, who celebrated his 90th birthday on 19 April 2008, was a British writer and artist who had consistently pursued his own unique brand of Surrealism throughout his career, which began in 1936. He was educated at Stowe School, where his formative influences were the novelist T. H. White who gave him great encouragement, and the school grounds, which are extensive and magnificent. In fact Randolph Cranstone's manor house, grounds and library in Bullock's various works of fiction are all based on the models at Stowe. After the war, Michael Bullock attended the Hornsey School of Art, which was also an important experience. After leaving Hornsey, he devoted himself to writing rather than art, including literary translation, for which he had a striking and virtually untrained ability (In 1966 he won the Schlegel-Tieck German Translation Prize and in 1979 the Canada Council French Translation Award). His literary activities gained him an invitation to the University of British Columbia in 1968, where he remained until his retirement as professor emeritus in 1983. Throughout this time, Bullock continued to produce drawings and paintings that were exhibited and reproduced in various parts of the world, as well as writing numerous books, all marked by his Surrealist style. Throughout his career, he had been in close touch with members of the Surrealist community in Britain and elsewhere, especially Herbert Read, Roland Penrose, Eileen Agar, and Conroy Maddox, as well as the Slovak artist Ladislav Guderna, who had also emigrated to Canada, and Joe Rose, who ultimately made his way to Australia. One of the first things Bullock did on arriving in Vancouver was to form the West Coast Surrealist Group, later to be called the Melmoth Group, consisting of both writers and artists and with its own international magazine, Scarabeus. In later years he practiced what he called Abstract Surrealism: while the works may look non-figurative at first sight, closer inspection in most cases reveals strangely haunting images rendered all the more striking by the fact that they are only glimpsed and are therefore subliminal. In this connection it is worth noting that one of the first books Bullock translated - and which brought him into personal touch with Herbert Read, who had previously encouraged him in his poetry - was Wilhelm Worringer's epoch-making work, Abstraction and Empathy, which, together with Kandinsky's On The Spiritual in Art, set the stage for the development of Abstract Art. Because so many of his books have been translated - for example, almost all have been translated in whole or part into Chinese and are reputed to exercise considerable influence on contemporary Chinese poets - he enjoyed an international renown as a writer. "My work is a mixture of styles, of which surrealism is almost one, but not always the only one. In poetry imagism is also a strong influence; occasionally, as in my books Stone and Shadow and Dark Water, the predominant one. Sometimes Surrealism and imagism hold hands. My fiction is and always has been totally surrealist. In visual art the role of imagism is played by abstract art in the sense that it is a counterbalance to surrealism, especially since I translated Wilhelm Worringer's famous book Abstraction and Empathy. One can know the value and warmth of those long associations only when they are gone. I could not believe my ears when I heard Michael was gone - something felt broken inside me. A rich, cherished and wonderful association of 34 years just disappeared like an illusion. a tree with a severed root. It was Spring. I remember it was Spring of 1974, and one afternoon I dared to go to Prof. Michael Bullock's office in the Creative Writing Department in front of the Buckhannon building behind the library in UBC. I was new in this country and I intended to go back to school, determined to get into Creative Writing studies and work on my script during the remaining months of my pregnancy. My child was due in July and the classes were starting in September. I was thrilled that Prof. Michael Bullock showed so much interest in my poetry, which I had translated from the Punjabi. That day, in a hurry, I left some seventy pages of poetry in his office along with my shoulder bag. As I was walking out from his office and almost to the road, I heard a voice, someone was calling "Maya...Maya...you left your purse..."; when I turned back and saw Michael running towards me. I felt embarrassed and my face became red, I could only say "thank you"; and we departed. I was so nervous. I know that the word 'Maya' on that day did not have any meaning for me. As I walked towards the bus stop, I wondered had the professor forgotten my name, or..."; Later when I was in Michael's poetry class, I became aware that perhaps my black hair and black eyes reminded him of one 'Maya' he knew a long time ago. Perhaps, I triggered his memories of 'Maya'. I became very curious to know more about Maya and her story. Michael indicated that he wanted to write to her but he did not have an address nor did he know where to contact her. He did not even know whether she was still alive or dead. I was surprised and amazed that an English Professor, was fascinated, by an Indian girl named 'Maya' and he intended to write her story after such a long time. Which he did later in 1986 when he found a small photograph of 'Maya'. He relived the illusion over and over which he mentioned in his book ";Randolph Cranstone and the Veil of Maya"; in the hope that one day she might see the book and recognize her photograph and might contact him. Michael was teaching poetry and translation in the Creative Writing Department at UBC. I was the only South Asian student in his class and I was translating poetry into English from my native language Punjabi. Towards the end of the program I completed my graduate thesis on poetry in translation - "The Glimpses of Twentieth Century Punjabi Poetry - An Anthology in English Translation"; with a forward written by Michael Bullock. I found Michael Bullock a very learned and knowledgeable professor in diversity and he was, intrigued by different languages. He had the capacity to see a word in ten languages at the same time and catching the difference between the sounds of the different languages. He was a magician of words, sounds and colours, and could paint a word as well as hear the music of it simultaneously. Michael Bullock along with teaching poetry encouraged me to read his earlier works - "Green Beginning Black Ending";, "Savage Darkness";, "Randolph Cranstone and the Pursuing River"; and "Sixteen Stories as They Happened"; along with imagist poetry and symbolism in literature. When I came to Canada and joined the Creative Writing studies, I had degrees in English and Punjabi literatures, but I was not familiar with surrealist literature and art. Michael's books and artwork opened up a new world of literature and art for me. His poetry was so soft and studded with colourful images from nature. I found his poetry was closer to Indian poet Tagore's Poetry. Later I translated some of Michael's poems into Punjabi, which were published in a Punjabi magazine "Watno Dur"; in late seventies. I pay my deep respect and homage to my mentor, teacher, guide and wonderful person to talk to. Michael Bullock, a great writer, artist and translator will be greatly missed in the South Asian writers' community as well as our bi-lingual poetry readings and multicultural events. Michael Bullock not only embraced multiculturalism but also he had encouraged many writers and translators from different languages to accomplish their bilingual works. This is a poem dedicated to Michael Bullock, a great teacher. in the layers of the silver clouds. behind the grim and grey clouds. and unable to decode those words. an illusion of life we keep on living. Once upon a time Michael Bullock came to our house in Burnaby to meet Canadian Punjabi writers. Visual artists, Lori-ann Latremouille and Angus Bungay accompanied him. The year was 1996. Michael hadn't yet settled on the sofa when Navtej Bharati presented Michael what looked like a neatly wrapped box of chocolates. "What do I do with it? "; Asked an utterly surprised Michael. Michael hesitated but started unwrapping, layer after layer, and finally opened the box, and saw one of Lori-ann's familiar paintings. It took him a while to realize the painting was actually the cover of a newly published book of his selected poems in Punjabi. "Look! "; he uttered showing the book to an equally surprised Lori-ann. Only Angus knew the secret, he simply smiled. Everyone clapped and congratulated Michael. It was an exciting scene. That's how Michael's selected One Hundred One Surrealist Poems, which I translated into Punjabi, was released. Later the book was recommended to the Punjabi graduate classes at Delhi University and often cited for examples of Modern Surrealist poetry. Originally a teacher of Surjeet (Kalsey) at the UBC Creative Writing Michael became a lifelong friend. He was a great friend indeed. I cannot believe that Michael has died. To my mind, he has just gone to London, as he did at least once a year during the more than 35 years that I knew him. He would disappear during these lengthy periods, to visit the family he loved, daughter Mim, son-in-law John, grandson Daniel and granddaughter Susannah. He would return with news of the family and, often, of an exhibition of his paintings and ideas for a new book of prose or poetry. Michael and I met on Kings Road, on campus. We rented row houses from Balfour Agencies, next door from each other. This was in the spring of 1971. I had just arrived from New York City to work in the UBC Library. Michael had been at UBC since 1968. Once I discovered my illustrious neighbor, my awe knew no bounds. In quick succession Michael published A Savage Darkness, Sixteen Stories as They Happened, Green Beginning, Black Ending, then, in 1975, the first of the Randolph Cranstone stories - Randolph Cranstone and the Pursuing River. I told Michael later that there were (I believed) two ways for me to read him. One way was to let the story or poem wash over me; to sort of soak it up. Osmosis. Through the pores. He nodded approvingly. "And the other way? "; he asked. The other way, I told him, was like a student of literature (which I had been in university). To look at, form and content and rhyme and plot and character. Michael asked me which way I preferred. "The first way,"; I said to him. "Just soak it up. "; And, I added, that is the only way I can possibly keep up with your prolific output. What creative energy this man had! A book would appear; I would be half way into it, only to be handed another. Autographed. Needing to be read. Michael was my first tennis partner in Vancouver. We played everywhere. Lord Byng Secondary School. The courts behind the Totem Park residences. He showed me a forbidden treasure: hidden behind massive hedges just off Marine Drive was the home of UBC's President, and adjacent to it, the perfect tennis court. Who could use it? I asked him. Who cares? he replied. So we carefully entered the sanctified grounds and played some memorable sets. We were evenly matched. His age and guile trumped my youth and enthusiasm. Michael was a dogged opponent. Very few unforced errors. This sense of colour will always be one of the ways I remember Michael. His ability to take the known, and transform it through colour and the clarity of simple word magic, into something different, something more real. So I end the way I began this recollection: Michael is not dead. He is transformed. Lori-ann told me that, Michael's ashes will be buried at the foot of the butterfly bush in Mim's garden - a bush and garden so dear to Michael's heart and so important in his work. We must let our imagination tell us the rest. You have been wonderful friends to Michael and now I have to bring you the news that he is no longer with us. His was the best of deaths. The nurses washed him and did his hair and he was in a side room with spotlessly clean linen looking completely himself, breathing with frailty, responding to questions with a small nod or shake of the head and occasionally opening his blue eyes to confirm or check who was there. I sat next to him gently holding his arm and with John next to me. I had put rosewater on his forehead and pyjama top so the room smelt as if there was a red rose floating about. The very young and pretty Chinese female doctor came in to see him and asked if she could have a copy of the Chinese & English book Serena has just translated to come out for the Olympics he, nodded and opened his eyes with a twinkle, took his last breath and was gone from us. He had said only a few days ago 'It is enough, I just want to go to sleep and not wake up' and that is what he has done. He had no regrets and nothing he had not done that he wanted to do and even Marcus wrote a perfect letter, which arrived on time. He was a lucky person and he made a real effort to lead his life fully. So we must all take comfort in that and remember with joy all the great times we have shared with him. Love from all here and a very big thank you for being such close and wonderful friends, you meant so much to Michael. How do I have the heart to accept your love in such a way? How do I have the heart to clasp you in my bosom like this? "Your book delighted me. Your stories are in exactly the vein that I wish to encourage - not only imaginative and very surrealistic in the best sense, but witty." "The rare quality in Mr. Bullock's stories is the graceful and potent interchange in them of reality and fantasy, the supple flow of imagery." "These short stories are weird but fascinating; their meaning maddeningly elusive... The Sixteen Stories are beautifully written. They are the product of a wildly original imagination..."
"Bullock is a master of fantasy, nightmare and enigma... This highly personal development of surrealism is both witty and disturbing." "Without a doubt, the exotic nature of Bullock's fables bears witness to one of the most wildly imaginative minds ever to reach the printed page." "The reader should not read these fables as if they were short stories, he should study them as if they were lyric poems, they demand that type of care and attention." "Talent and labour have produced these polished gnostic visions... Words become things, things in turn menace writer and reader, since for the gnostic, reality is always a malefic vision: these simulacra called fables both mime and are the world beyond the trapped self." "Michael Bullock is one of the most vivid, mysterious, and technically proficient poets writing in English today." "Bullock concocts verbal miniatures that have the subtle effect of a lingering perfume without substance, like the poesie pure of Mallarme." "Bullock has been quietly, unassumingly producing an original and highly skilled poetry that has gradually made a permanent place in Canadian and world literature." "This is the kind of poem I should like to have written myself." "Michael Bullock, a grand master of contemporary surrealism, plunges into the fathomless depths of the unconscious once again..."
Almost thirty years ago, about 1980, going into the Faculty Club at U.B.C., I noticed a man older than I who had an air of youthful panache about his informal and tasteful clothes. He was alone. I asked if I might join him for lunch. "By all means. Absolutely! "; was his instant response. We exchanged names and at once I realized that I had happened upon the English translator of the German play, The Fire Raisers by Max Frisch and also the famous novel I'm not Stiller. It turned out that Michael was a distinguished Full Professor in the Department of Creative Writing. I was just an Associate Professor at the time but this was not a matter of importance for Michael. More to the point was what a person did and whether that person was on the side of life and creativity. When he knew that my earliest published poems were on a Japanese theme, that I wrote poetry, come what may, despite all academic pressures to publish or perish, and after he had read some of my poetry, we became firm friends. This was a friendship as instructive as it was delightful, teaching me about Michael, of course, about the necessity for continuous work as a writer, and about surrealism in writing and art. Michael read my early poems and responded not with criticism of theme or form but of diction. Every word in a poem counts. Good lyric poetry cannot tolerate padding. Michael's own work, however fantastic, however spontaneous, however obsessive, is always lean and spare. Michael, prolific translator of some two hundred works from three languages, has had his own work translated into Chinese, Japanese, Indian and other tongues- and, as I believe, has himself now been translated into another form of energy, into a form of life beyond the body. Furthermore, his abundant and astonishing words have also changed. Things I read when he was alive, I sometimes half understood. Now I am older and I find that a dead man's words have an extra resonance for the living. I want to share with you a stanza he wrote in a book of poems called Erupting in Flowers (1999). Michael was born near the end of the First World War and lived through the Second and beyond the murderous Cold War. He lived through the lethal and the benevolent developments in shipping and submarines, aircraft, tanks, artillery, automobiles, astronomy, space travel, typewriters, computers, paints, felt tip pens, radio, television, the Fax machine, cameras, the cinema, video discs, and all the trappings of our contemporary existence. Despite his knowledge of the wickedness of some of us earthlings and of the "dirty devices of this world,"; he maintained his joy in life, his personal jauntiness, his good humour, and benevolence. He was optimistic despite his darkest visions. He was very kind to me personally at a time when I was extremely unhappy, doing my best to hide that unhappiness, and trying to remake my life. His circle of friends have all known his great generosity of spirit. As an artist Michael was utterly dedicated, serious, and very industrious. As a translator he was not interested in theories of translation but in actual achievement. You could say he subscribed to the "Just do it! "; school of translation. But he also wrote original novels, poems, and plays. He painted and sketched his organic forms, not so much still life, as life forms in convoluted motion. His artistic career stretched from just before World War II until the last few days of his life on earth, when he finished his last book. Michael was enriched as an artist by his many contacts with the people and the art of the Far East. He traveled as far as, and even further than Pierre Loti, one of his masters. And his relationship with his translators was always cordial, helpful, and friendly. Serena Jin, my colleague at the Chinese University of Hong Kong, can best speak from the point of view of a brilliant translator of Michael's many works, once his student, and always his friend. Another colleague and friend, from my years at the University of British Columbia, Jack Stewart, author of a penetrating, highly professional critical study of Michael, The Incandescent Word, an apt title indeed, can best speak of his writings and their links with visual arts. That inspired artist Lori-ann Latremouille, who has collaborated with Michael on so many projects, including bright, brilliant, and intriguing book illustrations, can best speak of his graphic art. as he does and at the speed of light! Michael Hale Bullock was born 19 April 1918 at Rossetti Cottage, opposite St. Michael's Church, Mill Hill, the then rural suburb of London. He had an artistic and musical family. In his first year he lost his mother to the Spanish 'flu epidemic following the First World War. He was then brought up by her sister, his wonderful Auntie Aylmer, a most artistic and talented dancer, teacher, who had a great sense of integrity and enthusiasm. She nurtured Michael with sensitivity and abundant love with the help of ever-present grandparents in the earliest years. He was surrounded by books and art and was a fluent reader at the early age of three. Of reading he said. "I cannot remember how I learnt to read I just remember always being able to read";. His first school was reached by a walk from home, through a lane bounded by fields. Here he developed a love of learning and language. Before the age of eight he studied French and Latin which ignited his fascination of languages which was to last all his life. His early sketchbooks also show his talent and love of visual art. At eight he boarded at St. Michael's Prep School, Uckfield, Sussex, where he prospered academically and then on to Stowe where he received excellent teaching and encouragement in languages, art, and in particular English from the distinguished writer T.S. White. It was here in the magnificent grounds of Stowe that his love of nature inspired him to write his first poems and other creative works, which were received with enthusiasm by T.S. White. A trip to Germany when Michael was in his late teens, with his father who was on leave from India, brought him into contact with Ernst Feider a young writer who was to be an influence on Michael. At the same time, in the same town, his wife to be, Lotte Schneller, writer, artist and sociologist, was also staying. However they did not meet then. He worked his passage by boat to India, where he would spend a year visiting his father and stepmother. While in India he explored the Himalayas on horseback, visited out of the way places, and very met interesting people from many walks of life. Michael met Lotte in 1939 in Hampstead, London. Lotte was a newly arrived Jewish refugee from Berlin. At that time, Michael was working to help the Jews to get out of Natzi Germany. Their love of language, literature, art, and their idealistic political views and humanitarian ideals brought them together. They both joined The Progressive League with other likeminded people. The pressures of the war years were tough for them as for so many others. Lotte and Michael provided a home for her young brother who had come out of Berlin on a kinder transport. They were soon to have their own two children, Miriam and Marcus. Michael attended Hornsey school of Art where a number of his fellow students and good friends were constant welcome visitors. All were nurtured by Lotte's cooking, their love of people, and lively conversation. However, there remained the everpresent problem of earning a living. Finally, with encouragement from Herbert Read and T.S. Elliot, Michael chose languages over visual art to make a living. Lotte and Michael where both bi-lingual and there was constant discussion on the meanings of words and much collaboration between them in the early years. As Michael's translating ability developed, Lotte turned to developing her own career by taking a degree in sociology, and pursuing her own creative writing. She had the good fortune to have her first novel, Aquarius Angel, published by Macmillan in 1970. Both Lotte and Michael took great pleasure in their two children, and three grandchildren, and spent as much time with them as possible. Lotte died in 1980. In the latter years of their marriage their paths went in different directions. At the age of 50, Michael was invited to be a visiting professor in the department of Creative Writing and Translation at the University of British Columbia, in Vancouver BC. There was always a high level of communication between Michael and Lotte. At the end of her life he took a years sabbatical from the university to be with her. Michael's three grandchildren Susannah, Zoe and Daniel were a great enrichment to his life. He participated in their lives with pleasure, interest, enthusiasm, tremendous affection and was always proud of their achievements. He spent as much time with his family as possible. He had a tremendous capacity to develop empathetic relationships and this was very much the case with all his family including his son in law John. He spent the long University holidays with his family in the UK and Europe. As a child among my fondest memories of my father were those of long holidays staying on the Helligan estate in a cottage, or at the harbour side village of Mevegissy, in Cornwall, UK. Taking long walks in the countryside and in particular in the wild garden of Helligan. Having picnics and swimming in the sea, sitting on top of Michael's shoulders, and glimpsing far off countryside views. Following him, leading us through tall bracken with his old fashioned rucksack. I see him in my minds eye so often surrounded by nature. At Kew gardens and in the family gardens so much loved and written about by him. Above all the aura of enthusiasm, which was with him always. International events were an engagement and preoccupation which stayed with him always. When in the last years he discovered Twenty Four Hour Television News, he watched it avidly and when asked if it wasn't a bit repetitive, he responded "I like to see events as they happen and therefore feel part of it. "; Even to the last days of his life he took great interest in having the newspaper headlines and leading articles read to him, and discussing current events. His perception and attitudes were always on the same wavelength of the young, and firmly focused on the present. In parallel to this was his memory and experience covering a large expanse of time, of places and of people and of change. His intellectual capacity was always bright and he was always stimulating to be with. His last two years were spent in England living with his family, with whom he was so pleased to celebrate his 90th birthday on the 19th of April 2008. He enjoyed the company of the younger generations and in particular that of his young great granddaughter Gabrielle who shared his love of visual art, stories, nature, and the beloved walled garden. During his last hospital stay he was attended by, a young beautiful female Chinese doctor, Dr. Tao, with whom he discussed poetry and promised a copy of his latest book the Chinese/English bi-lingual version of Colours due out at that time. In his last days he said he had done everything he wanted to and "it was enough";, he sent messages and love to close friends and absent family. "I wouldn't be very happy if you weren't! "; he replied. Michael died peacefully on 18 July 2008 with his daughter and son in law at his bedside, with the gentle aroma of rose water and surrounded by cards and messages from family and friends from far and wide. The richness of his company will be with us always. I will miss Michael's cheerful presence and creative company, as I'm sure we all will. I know he and I had an affinity of taste, because we always seemed to choose the same thing for lunch. But his writing gave me much food for thought as well as the sheer enjoyment of reading him and talking to him. It was fascinating to watch him create a web of images-moons, mirrors, dark roses, dark water-in which to capture iridescent moods, moments, and memories. Michael's world was one of constant metamorphosis. Like Randolph Cranstone, he was a quester in labyrinths of the self, a voyageur on inflowing rivers. To attune oneself to his wavelength was to share "tremulations on the ether"; (as D. H. Lawrence puts it) of a creative psyche. Michael's first work, Transmutations, appeared when he was 19 or 20 and its title is prophetic. The poet turns amorphous contents of the unconscious into language. "The miracle of this transmutation,"; says Roland Barthes, "makes style a kind of supra-literary operation which carries man to the threshold of power and magic"; (Writing Degree Zero 18). Michael was eager to make that journey and cross that threshold on the Pegasus steed of imagination. At the heart of his universe is the image, crystalline and multifaceted or sombre and mysterious, transparent as a magnifying glass or opaque and gravid with feeling. His images translate being into seeing, start ripples expanding in the reader's imagination. But their ultimate significance is often hard to fathom. Images also translate sensations into words and here Michael's experience as a translator stood him in good stead. It is as if he were a Double Ego, the left brain playing ringmaster to the "circus animals"; (Yeats's metaphor for his own images) of a prolific right-brain imagination. Prolific and protean. Metaphor transports the mind from one thing to another, connecting and fusing opposites. In Michael's surreal narratives, change is the only constant, as one shape suggests-and digests-another. On this creative carousel, animals, birds, fish, flowers, trees, landscapes, and bodyscapes come to life, meet, and change places. But a pattern always emerges, making his stories extremely readable. Michael's work deserves a wider audience-his fantasies and fables may seem esoteric, but they are surprisingly accessible. Michael was not only a poet and storyteller, he was a doubly gifted artist. He emanated a creative aura and communicated his love of the creative process to others. Many varieties of art appealed to him, as we can see by looking at the cover art and illustrations by himself and others (including family members, Susannah and Daniel Cartwright) on or in many of his books. Vibrant designs in colored inks on paper accompany the highly visualized poems of Colours, that book being the fruit of a creative collaboration with Lori-ann Latremouille and Angus Bungay. As well as the fundamental personal sources of his imagination-the loss of his mother in infancy left an emotional void he always sought to fill-Michael had a vast knowledge of French, German, and Italian literature, and of the visual arts. It was part of my literary education to discuss French symbolist poetry or German expressionism with him. He wrote ekphrastic poems about artists-Chagall, Miro, Klee, Ernst, and Ladislav Guderna, whose surreal graphics and collages adorn several of his books. Michael's artist poems translate pictorial images into words, showing a keen sensitivity to the sister arts. In Barthes' terms, he was both a writerly and a painterly writer. The writerly text invites the reader to participate; it is as if he or she were creating the text rather than merely reading it. The receiver of this communication shares the dream as it unfolds and takes on form; the barrier between subject and object disappears. The writerly text lets its reader feel the elan of invention; the painterly text conjures up images as if they were being painted in front of one. Barthes writes: "If I read this sentence, this story, or this word with pleasure, it is because they were written in pleasure,"; and this is very true of Michael's writing. Barthes adds that a writerly text "invites all words to perch, to flock, to fly off again: a marbled, iridescent text; we are gorged with language"; (The Pleasure of the Text 4, 8). So, in Michael's writing, one senses the movement of his imagination swooping down on objects and animating images. At the same time, his writing is crisply economic in the way it delineates bizarre events. In poetry, he loves the shorter forms like haiku or tanka that suggest more than they state. He does not release "undisciplined squads of emotion"; (Eliot): his words are as carefully concocted as a secret potion. I will leave with you a few personal memories and a meditation. Sitting across from Michael in a leather armchair in Garden Court, petting his plump grey cat, while he describes his latest projects. Michael reading his poems in the Scholar's Study at the Dr. Sun-Yat-Sen Gardens on the verge of Chinatown. A small group of us sitting on tatami mats at a restaurant in Japantown, drinking sake and dipping chopsticks into steaming dishes. Michael reading his poetry at the Vancouver Public Library in May followed by a full moon rising over the steps of the colosseum. Ambling with Michael around the Nitobe Gardens in spring, under sweeping boughs of cherry-blossom, we move from an island in the pond surrounded by golden carp, up past the waterfall, along the water's edge, and over a hump-backed bridge to the Tea-house, where we listen to a concert on the ten-stringed samisen. Michael explained that this jewel Japanese garden was a microcosm, in which one traced the path of life from beginning to end, reorienting oneself to one's existence. He loved woods and gardens and I remember our visits to UBC's Asian Gardens in May, when the huge Himalayan rhododendrons were out, bringing back romantic memories to Michael of his youthful trip to India. I am sorry I won't be able to tour the treetops with him, when UBC opens the new aerial walkways. When I think of Michael, I think of the colour purple, moons and mirrors and the way he introduced me to my Latin namesake Aurora. He brings out rainbows in nature and will be found in blue butterflies kissing magnolias. It was good karma that I met Michael at UBC in the 60's. In my young days, I played tennis with him and also guided him to use a Chinese writing brush. In recent years, since we were neighbours, I occasionally visited him and our conversations were always cordial. Michael thanks for the fond memory! I treasure the time I shared with you whether it's poetry reading with you or just chatting with you in your cozy apartment. Your wisdom and smile will always live in my memory. It's my privilege to have known you and to have translated your Moons and Mirrors. In eternality you will always be my good friend as well as my caring teacher. Across ten thousand miles my thoughts fly to you, a swarm of pastel-coloured moths to beat against your window-panes in the dark. Will you hear them and let them in? Or will you find them in the morning, dead on the sill, sweep them up and throw them away? Whatever happens, they will continue to fly until they form a fluttering rainbow over sea and land, across which I can walk to you and beg for admittance, bearing in my hand a bouquet of dream flowers. And I have paused on a small bridge to watch the trout and the reflection of a pine. Yet I did not see Sumiko take her wooden bucket down to the spring. In the evening I sit among the rising shadows, and contemplate the changing light. Far away where the colors fade I hear voices muffled by the wintry trees. In 1968, when I received an invitation to join the faculty of the Creative Writing Department of the University of British Columbia, the name Vancouver meant almost nothing to me. I looked it up in the Encyclopedia Britannica, where I read that "Stanley Park is the largest urban park in the world";. I immediately cabled my acceptance of the invitation. This first reaction proved thoroughly well-founded. Not only is Stanley Park an extensive and very varied expanse of unspoilt nature, the whole city is permeated by nature in the shape of parks, woodland - in the shape of what were the University Endowment Lands and are now called the Pacific Spirit Park, to which I dedicated a whole volume of poems - botanical gardens such as the Nitobe Garden, the Botanical Garden and the Asian Garden on the University campus, Jericho Park, and the VanDusen Gardens in the city and, in Chinatown, the Dr Sun Yat-Sen Classical Chinese Park and Garden. Moreover all the streets are tree-lined, including many blossoming trees such as cherry and plum trees, which in spring give the city an almost overwhelming beauty. All the trees in Vancouver's streets are protected by law, so that no one can damage them in any way. Their value to the city is fully recognized by the municipal authorities, which I find extremely reassuring. Since the suburbs contain a great number of single-family houses, each with its own garden, the profusion of flowers at all seasons except winter is a striking feature of the city. Vancouver is penetrated by English Bay, an arm of the ocean that bisects it into the south shore, where Vancouver proper, including the University campus and the parks and gardens I have mentioned are sittuated, and the north shore, comprising West Vancouver, including Lighthouse Park, which rivals Stanley Park on a smaller scale, North Vancouver and behind them the Coast Mountains which, through most of the year, are snow-capped. If I have spent so much time describing the natural beauties of Vancouver, at the risk of sounding like a travel brochure, it is because these natural beauties have inspired so much of my poetry, including Poems on Green Paper which is dedicated to the University Endowment Lands, where and about which most of them are written, and Vancouver Moods, which encompass all the places I have mentioned. I was always something of a nature poet, but since coming to Vancouver this tendency has been constantly strengthened. In this respect I feel that I owe a great debt to Vancouver. After its natural beauties the second outstanding feature of Vancouver is its cosmopolitanism. It has been said that no one who lives in Vancouver needs to travel, since every part of the world is represented here. This is literally true. One feature of this cosmopolitanism, and one which I personally particularly appreciate, is the vast number of inexpensive restaurants serving the food peculiar to every imaginable region of the world. Most are probably Chinese, representing every part of China, Indian, again representing every region of that country, and Japanese. My belief that they exist in that numerical order is not based on any scientific survey and may merely represent my own preferences. It is, however, certain that the Chinese are the most numerous ethnic group after Europeans. This is much to my liking since a great many of my books have been translated into Chinese and far more copies are sold in China than anywhere else, including Canada. I have been told, not necessarily reliably, that I was a Chinese poet in a previous incarnation. It is, in any case, a fact that I have always been drawn to Chinese culture and that my poetry has great affinities with Chinese poetry especially in its attitude to nature. My links with the Chinese community in Vancouver are close and are certainly a factor in my decision to remain here after my retirement more than twenty years ago. There is a bustling Chinatown where my Chinese friends do much of their shopping and where some of them go to purchase Chinese medications. It is, I believe, one of the largest and most fascinating Chinatowns in the world. There is also a large Indian, mostly Punjabi, population and an Indiatown, which is noteworthy, apart from Indian restaurants, for the countless shops selling dazzlingly colourful saris. Prior to the internment of the Japanese during the Second World War there was also a flourishing Japantown and a considerable Japanese fishing fleet. Only vestiges of Japantown remain, but I am glad to say that Japanese restaurants are ubiquitous! I have said nothing yet about culture, not because it takes a back seat in Vancouver, but because it is much the same as everywhere else. There are countless art galleries, including the Vancouver Art Gallery, numerous theatres and movie theatres, a plethora of bookshops and an excellent Public Library with branches all over the city. For me personally the main interest of the Public Library is as a venue for my frequent poetry readings. As far as borrowing books is concerned I rely mainly on the outstanding University Library. The University, of course, makes an inestimable contribution to the cultural life of the city, especially since the building of the Chan Center for the Performing Arts, and the opening of the downtown campus. Prior to my retirement and the death of my dear friend Dr. Peter Loeffler UBC could be said to have had two direct links with Switzerland. Peter Loeffler, a Swiss poet, dramaturge and writer on the theatre was a professor in the Theater Department. I myself was the official English translator of Max Frisch and the translator of many other Swiss authors. Unlike any other city I can think of outside China Vancouver has a major Chinese cultural center and Museum, alongside the Dr. Sun-Yat Sen Classical Chinese Park and Garden, which are also without parallel in any other city outside China and one of the most poetically inspiring places in Vancouver. No discussions of Vancouver would be complete without a reference to its climate. The popular image of Canada is one of cold and snow most of the year. This a true picture of most of Canada, but certainly not of Vancouver, frequently referred to in the rest of Canada as Lotusland. Thanks to a warm current off the coast Vancouver rarely experiences snow or really cold temperatures. Its climate is rather similar, and for much the same reason, as that of south Cornwall in England. Indeed, snow is so rare that when it does fall it causes chaos and the resentful feeling that it has no right to fall in Vancouver. At least that is how I feel. Vancouver must be one of the few cities in the world where you can swim in the ocean and a couple of hours later be skiing in the mountains. When the time came for me to retire in 1983, there were only three cities I considered: Vancouver, my native London, and Hong Kong, the latter because of my frequent visits to give readings and lectures at the Chinese University of Hong Kong. Hong Kong dropped out of contention when it was taken over by China and, according to the reports I received, lost much of its charm. The choice between Vancouver and London was more difficult to resolve - but here I am, still in Vancouver.